While the last two posts weren’t specifically aimed at RxVMS, they are a necessary requirement to understand the RxVMS architecture. Today, we turn to the important packages you will need to use RxVMS in your own App. …you might have wondered how the various views, managers, and services are able to know of each other. More importantly, you may be wondering how one element is able to access another one’s functions. While there are many different ways to achieve this (e.g. Inherited Widgets, IoC containers, dependency injections…), I personally prefer the use of a service locator. I wrote a whole blog post on the use of my Service Locator GetIt, but I’ll give a short introduction here as well. Basically, you register types or objects in the ServiceLocator (SL) once, and then you can access these objects from anywhere in your app. This is similar to how you’d use a Singleton…but with more flexibility. GetIt’s usage is pretty straightforward. At the start of your app, you register the Services or Managers that you will want to access later in other parts of your app. After that, you call the SL to access instances of the registered types. The nice thing is that you can register an interface or abstract class together with a concrete implementation. When accessing the instance, you always ask for the interface/abstract class type. This makes it easy to switch the implementation by just switching the concrete type at registration time. This allows you to easily switch a real Service for a MockService. I typically initialize my SL in a file called service_locator.dart, which also contains the global (ambient) variable for the SL. This will be the only global variable in your app. Extremely important: If you use GetIt, ALWAYS use the same style when you import your project files. Either use packages (recommended) or use relative paths, but never both. Again, DON’T mix relative paths with packages! This is because Dart will treat them as two different files, even though both are referencing the same file. If this was a bit too quick, please read my blog post for more details. boilerplate – We must always create a function, a StreamController, and a getter for the Stream if we don’t want to expose the whole StreamController. busy states – While the function is running, what if we want our UI to show a Spinner? error handling – What happens if lookUpZip throws an exception? Sure, we could add more StreamControllers to handle busy states and errors…but this gets tedious if we have to do that manually for every event handler. That’s where the rx_command package comes in handy. RxCommand solves all of the above issues and more. An RxCommand encapsulates a function (sync or async) and automatically publishes its results on a Stream. Which is much more concise and readable. canExecuteInput is an optional Observable<bool> which you can pass to the factory function when creating an RxCommand. It signals the RxCommand if it can be executed, depending on the last value it received over this Observable. isExecuting is an Observable<bool> that signals if the command is currently executing its wrapped function. When a command is busy, it cannot be triggered a second time. If you want to display a Spinner while the wrapped function is running, listen to isExecuting. canExecute is an Observable<bool> that signals if the command can be executed. This synergizes well with a StreamBuilder to change the appearance of a button between enabled/disabled. It will emit true only if isExecuting emits false AND canExecuteInput hasn’t emitted false. thrownExceptions is an Observable<Exeption>. All thrown exceptions that the wrapped function may throw will be caught and emitted on this Observable. It is ideal to listen to it and display a dialog if an error occurs. (the command itself) is actually an Observable. Values returned by the wrapped function will be emitted on that channel, so you can directly pass an RxCommand to a StreamBuilder as a stream parameter. /// During normal command execution, you will get this item's listening at the command's [.results] observable. For the different variations of possible handler functions RxCommand offers several factory methods for synchronous and asynchronous handlers. They look like this. RxCommand.lastResult gives you access to the last successful result value of the commands execution. Which can be uses as initialData of a StreamBuilder. If you want to get the last result included in the CommandResult events while executing or in case of an error you can pass emitInitialCommandResult=true when creating the command. If you want to assign an initialValue to .lastResult e.g. if you use it with a StreamBuilder's initialData you can pass it with the initialLastResult parameter when creating the command. The latest version of the https://github.com/escamoteur/making_flutter_reactive- repository was refactored to RxVMS, so now you should have a good example on how to use it. You can combine different RxCommands together. Notice how switchedChangedCommand is actually the canExecute Observable for updateWeatherCommand. // Here we use the textChangedCommand! We have already seen one way to react to the different states of a command using CommandResults. In cases where we want to display if the command has succeeded (but not display the result), a common pattern is to listen to the command’s Observables in the initState function of a StatefulWidget. Here is an example of a real project. If you want to react to more than one Observable, you may have to manage multiple subscriptions. Directly managing the listening and freeing of multiple subscriptions can be challenging, makes the code less readable, and puts you at risk for making mistakes (e.g. forgetting to cancel during dispose). You don’t have to pass all of the handler functions. They all are optional, so you can just pass the ones you need. You only have to dispose the RxCommandListener in your dispose function, and it will cancel all of the internally-used subscriptions. An ImagePicker dialog is shown. After an image has been selected, the image is uploaded. Once upload is complete, the command returns the storage location of the image so that a new image chat entry can be created. As a rule of thumb, I would only use an RxCommandListener if I wanted to listen to more than one observable. Give RxCommands a try and see how it can make your live easier. You don’t need to use RxVMS to benefit from the power of RxCommands. For additional information about RxCommand read the readme of the rx_command package. Unfortunately I’m pretty busy in a client project at the moment so that I can’t say when the next post will be ready, so please have a bit patience. This time we will make a shallow dive into the magical realm of Reactive Extensions (Rx). I will focus on the most used functions of Rx and explain their application. If you haven’t read the previous post you really should do this first so that you can follow this one. RxDart Rx implementation for Dart for which we have Frank Pepermans and Brian Egan to thank. If you already used Rx in other languages you might notice that some functions differ a bit in their naming but you should easily get accustomed. So far we used Streams as a way to get data from one place in our App to another but they can do much more. Let’s have a look at some features that Rx adds to Streams. This will create an Observable that emits values forever at a specific rate. So instead setting up a Timer it might be easier to use this. Sometimes an API demands a Stream/Observable but you just have a simple value. For this the Observable has a factory method just. Creating an Observable from a Future will wait for the Future to complete and emit the result value of the Future or null if no value is returned. Another way to create a Stream from a Future is calling toStream() on any Future. Subjects are the StreamController of Rx and as you can imagine RxDart implements them using a StreamController under the hood. You can listen() directly on a Subject without accessing a Stream property. More than just one subscription is possible and all listening parties will get the same data at the same time. You can see that Item1 is lost for the second subscriber but it gets Item2. You might be surprised that the second Subscriber gets Item3 before the first subscriber gets Item2. This because you cannot guarantee the sequence in which subscribers will get served. Still all subscribers get the data in the correct order. BehaviourSubject only caches the last received item for late Subscribers. If you need more items cached you can use a ReplaySubject. In most cases this is not needed. The true power of Rx is that it allows you to process/manipulate data while it’s passing down a Stream. Each of the Rx methods return a new Stream with the resulting data (like the second conveyor belt above) which means you can chain them together to one processing pipeline which makes them extremely powerful. As a side note, not only Streams but any Iterable offers a map function that you can use for transformations on Lists. This is one of the little Rx gems! Imagine you have a search field that triggers a REST API call if its text is changed. Doing an API call on every single key stroke is expensive. So you would like to only make a call if the user pauses for a moment. Exactly for this is debounce() it will swallow all incoming events if they are not followed by a pause. So if you convert an onChanged handler of a TextField to an Observable you can do so elegantly. You will see an application of this further down in the FireStore example. If you have multiple different Streams but you want to handle its objects together you can use .mergeWith (in other Rx implementations just merge) which takes an array of Streams and returns one combined Stream. .mergeWith does not guarantee any order in that the both streams are combined. They get emitted on the resulting stream like they come in. A more practical application is if you need to wait for two async functions that return a Future and you want to process the data as soon as both results are returned. In this slightly contrived example we imagine two REST APIs, one returning a User, the other a Product as JSON strings and we want to wait for both calls before we return an Invoice object. Before combineLatest emits its first value all source streams have to deliver at least one item. In your UI you then can consume isBusy with a StreamBuilder to display a Spinner if the received value is true. combineLatest is also powerful function in combination with FireStore snapshots streams. In your UI you could then use this like: StreamBuilder<CombinedMessage>(stream: model.getCombinedMessages(),...). The Observable returned by getDependendMessages will emit a new CombinedMessage each time the newsCollection changes. Which means we now can set breakpoint or add print statements on every stage of our processing pipeline. The duty of map() is transforming the data on the Stream, NOTHING else! If the passed mapping function does something else this would be considered as a side effect which are hard to spot when reading code and hide easily bugs. To avoid any memory leaks always cancel() your subscriptions or dispose your StreamControllers, or close your Subjects as soon as you do not need them anymore. Streams are the main building block of RxVMS so we will take a closer look at them in this post because understanding Streams is an absolute requirement to understand RxVMS. It turned out that including Rx in this post would make it too long so I split it two parts. I read a lot of comments that say Streams and especially Rx is too hard to understand, so they don’t use it. I like you to know is that I don’t count myself a Rx wizard. Mastering the full power of Rx is not easy I admit that and I’m still learning. But let me set right one misconception from the beginning: You don’t have to be an Rx wizard to gain a lot of benefits using Streams and Rx. I will try to do my best to explain Streams as easy as I can. To avoid having your data object drop off into the void you can set up a “trap” at the end of a Stream. The trap will catch any arriving object and do something (react) each time it catches an item that reaches the end of the belt. After putting an object on the Stream you don’t wait for it to reach the end because the Stream will handle all of that in the background. You can setup a trap long before the first item will arrive. It’s “First In First Out”. Items will always come out in the same order they went in. Rx, short for Reactive Extensions, are Streams on steroids  Rx is a concept very similar to Streams that was invented for the .net framework by a team at Microsoft. As .net already had a type Stream that is used for file I/O, they named them Observables and created a lot of functions to manipulate the data that moves through them. Dart has Streams embedded in its language specification which already offer a lot of this functionality, but not all of it. That’s why the RxDart package was developed; it’s based on Dart Streams, but takes things further by extening their functionality. Wie will take a closer look at Rx in the next part of this series. Dart Streams and Rx use some nomenclature that can look a bit scary, so here’s a translation. I’ll show Dart first, then Rx. Stream/Observable This is the conveyor belt discussed above. A Stream can always be converted to an Observable and you can assign Observables anywhere you use a Stream. So don’t get confused if I use these terms interchangeably. StreamController/Subject The “left” side of the conveyor belt, where you put data on the Stream. The two differ slightly in their properties and features, but serve the same purpose. Emitting an item/data The moment when data appears at the end of the conveyor belt. If you want to follow along with the following chapters, please clone this project for the basic Stream examples. I’ll be using the Dart/Flutter testing system. The generic type (in this case String) that has to be passed when creating a StreamController defines which type of objects we can push onto the Stream. This can be ANY type! You can create a StreamController<List<MyObject>>() if you want to, and it will transport a whole List instead of single objects. In my opinion the biggest problem for people who are new to Streams is that you can define the reaction for an emitted item long before the first item is is pushed on the stream that causes that reaction to get called. As wrote above, listen() expects a function that takes a parameter, and this parameter needs to be of the same type that the StreamController was created with. This function can be a lambda, like in the example above, or it can be any other function. * Otherwise it is called with just the error object. * and will be passed to the current [Zone]'s error handler. * as if they were uncaught top-level errors. * called. If [onDone] is `null`, nothing happens. * when the first error event is delivered. The default is `false`. This means you can do more than simply pass one handler for emitted data, you can also have a handler in case of errors and if the Stream is closed from the side of the Stream controller (onDone). Exceptions that get thrown from inside the Stream will call onError() if you provide it, otherwise they’re just swallowed and you’ll never know that something went wrong. To make it easier for you to follow the next chapters, I made a separate branch in the repository. here you can see a very typical pattern: Instead of publishing the whole StreamController, we just publish its Stream property. In order to make the Model accessible by the UI, I made it a static field in the App object because I didn’t want to introduce an InheritedWidget or a ServiceLocator. We can get away with this for a simple example but I wouldn’t want to do it with a real App! InitState() is a good place to set up the ‘trap’, and being good Dart citizens we always make sure to free the subscription in dispose(), right? In the widget tree we just need to adapt the onPressed handler of the FAB (Floating Action Button). By doing this, we’ve created a clean separation between View and Model, using a Stream. In the above layout, one big advantage of using StreamBuilder compared to the first solution is that calling setState() in listen() will always rebuild the full page, while StreamBuilder will only call its builder. The snapShot variable contains the most recent data that was received from the Stream. Always check to ensure it contains valid data before using it. In the next post we’ll take a look at how to transform the data on our Streams and do it on the fly. But please be patient, I won’t be back from vacation till the end of August. Many thanks to Scott Stoll for proof reading and important feedback. It is really important to me that you understand Streams. If you didn’t understand something in this post or think it could be better explained please let me know so that I can improve it. I’m in software now for about 20 years. I started with mobile 4 years ago with Xamarin Forms because cross platform was the only thing that made sense to me for an Indie App. 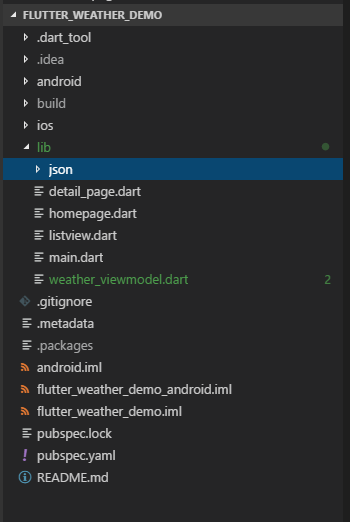 Xamarin Forms almost forces you to use MVVM because you define the UI in XAML so you need some glue layer to connect the UI to your Model seems to make a lot of sense on the first view. While working with Xamarin I was introduced to ReactiveUI and fell in love with streams and Reactive Extensions (Rx) which made my Apps much more robust. BLoC If I hadn’t already started to work on my own pattern when BLoC was promoted I probably would have be stuck with it because it offers a really flexible and reactive solution. What I don’t like is that it publishes Stream Sinks so I can not just pass a function/command to an event handler of a Widget. Also BLoC does not tell you how you should structure your App as a whole. There is no clear definition of how big a BLoC should be or what’s the scope of a single BLoC. I have almost no project I have seen that whole layers got reused. If you have generic code that can be used somewhere else it makes much more sense to factor that out into a generic library. Also replacing whole layers is not a really common use case. Most people will never replace a data base after an App is beyond a certain development stage, so why add an abstraction layer for it. And in case you really have to our current development tools make refactoring quite easy. What it makes indeed easier is testing. I don’t say you shouldn’t use layering but I question if we have to do it as strictly as we did in the past. Extensive layering lets you use a lot of code and can make problems in keeping a single source of truth of your App’s state. Introduce layers only where it helps you not just because it’s a best practice. So what do I expect from an ideal architecture? Given the aimed stateless nature of Flutter UIs one Page/Widget shouldn’t depend on another Page/Widget or change another Page/Widget. This lead to the idea that every Page/Widget should be self responsible for displaying itself and all it’s user interactions. This will make it easy to understand how your App works as you typically explore an App beginning from its UI. It also would make it easy to split work between developers because one developer can work on one Page without the need to know of the work of others. RxVMS is an evolution of RxVAMS that I described in a previous post While applying RxVAMS in my current real world Flutter project I realized some weaknesses in it and improved it. The current result of all this thoughts is what I call RxVMS which stands for Rx-View-Managers-Services. It fulfils all the above goals with the only requirement that you have to grasp Streams and parts of Rx. To help you with that I will devote the next post. These are abstractions of interfaces to the outside of your App this can be a Database which requires you to serialize your objects, a REST API or some hardware of your phone. They don’t change any state of your app. Managers group together semantically related functionality. Like everything needed for user management / authentication, everything related to an order or to your product catalogue. They provide CRUD operations on your objects. Every state change (change of data of your App) has to be done through a Manager. They typically don’t store state themselves unless it’s critical for performance or it’s data that doesn’t change throughout the live time of the App. They also can provide data sources for views if the data needs some additional transformation after retrieving it from a service. An example could be if you need to access two different data sources and combine them to one business object that a View can display. Managers can interact with each other. Typically a StatefullWidget or a Widget that contains a StreamBuilder so that it can consume returned data from Managers or Services. This will often be a whole Page but could also be a complex custom Widget. They do not store any state that has to persist. Views are allowed to directly access Services so far they don’t change any state. Although not in the diagram this are the objects that represent your business objects. In other models they belong to their own Model layer which also contains all business logic. In RxVMS they don’t contain any business logic that could change state. They are almost always plain data objects. (If I had included them it would have got RxVMMS which is long and VM could be misunderstood as ViewModel). Logically they belong to the manager layer. In the upcoming posts we will explore this parts and how they work together in detail. Most people when starting with Flutter will start looking for a way how to access their data from the views to separate them. What’s recommended in the Flutter docs is using an InheritedWidget which not only allows to access data from anywhere in the Widget tree but also should be able to automatically update widgets that reference it. Any descendant of InheritedWidget should be immutable which means you cannot change its data but have to create a new instance with new data. To be able to do this inside the widget tree you always have to wrap it in a StatefulWidget. If an InheritedWidget changes not only the Widgets that reference it will be updated, because not the Widgets but the next surrounding context get registered. Which means that at least this full context including all its children will be rebuilt. Meaning if you place your inherited Widget at the very base of your tree it will rebuild the whole tree. When reading the docs you get the impression that it shouldn’t be that way but neither I nor other developers I know have managed it that only referencing widgets get rebuilt. So you would have to add different InheritedWidgets at different places inside your tree to minimize the rebuilt. Flutter will look into the next outer context and check if its registered in there. If not it will walk up the tree and check in the outer contexts too, meaning depending how deep you are in the tree this can take some time. Given that the automatic updating of referencing widgets seems not to be optimal implemented we might ask why should I use an InheritedWidget at all. Especially if you are using the InheritedWidget only to access your model from anywhere e.g. when using the BLOCK or other reactive patterns there are other solutions that might even be better. Might be the very first thing that springs to mind. While a Singleton greatly solves the job of making it easy to access an object from anywhere it makes unit testing very difficult because you only can create one instance of it and its hard to mock. While this is a possible alternative to solve accessing a certain object while keeping it flexible to test I have some objection against automagical injection of objects at runtime. IoC containers typically need some sort of reflection to figure out which objects have to be injected where. As Dart doesn’t support in Flutter this can only be solved using code generation tools. Like with IoCs you have to register types that you want to access later. The difference is that instead of letting an IoC inject instances automatically you call the service locator explicit to give you the desired object. One nice side effect of using an Service Locator or IoC is that you are not limited to use it inside a widget tree but you can use it anywhere to access any type of registered objects. Coming from C# I was used to use a very simple Service Locator (SL) called Splat. So I tried if I could write something similar in Dart too with the result of GetIt. GetIt is super fast because it uses just a Map<Type> inside which makes accesses to it O(1). One big difference to C# is that Dart allows the use of global variables. Which means I didn’t need to implement GetIt as singleton or static class to access it from anywhere in the App. I almost can here some of you shudder when reading the word ‘global variable’ especially if you are an old timer like me who was always told globals are bad. Not long ago I learned a much nicer term for them: ‘Ambient variables’ which might sound a bit like a hyphenism but actually describes the intention much better. These are variables that keep objects instances that define the ambience in which this app runs. It’s pretty straight forward. Typically at the start of your app you register the types that you want later access from anywhere in your app. After that you can access instances of the registered types by calling the SL again. The nice thing is you can register an interface or abstract class together with a concrete implementation. When accessing the instance you always ask for the interface/abstract class type. This makes it easy to switch the implementation by just switching the concrete type at registration time. I refactored a very simple example to use GetIt instead of an inherited Widget. To initialize the SL I added a new file service_locator.dart which also contains the global (ambient) variable for the SL. That makes it also easier to reference it when writing unit tests. GetIt has different methods to register types. registerSingleton ensures that you always get the same instance of the registered object. Extremely important if you use GetIt: ALWAYS use the same style to import your project files either as relative paths OR as package which I recommend. DON’T mix them because currently Dart treats types imported in different ways as two different types although both reference the same file. Only the first time you call get<AppModel>() the passed factory function will be called. You are not limited to register any type at start-up. You can do it also later. If necessary you even can override an existing registration. By default you will get an assertion if you try to register a type that is already registered because most of the time this might not your intention. But if you need to do it you can by setting GetIt’s property allowReassignment=true. Testing with GetIt is very easy because you can easily register a mock object instead the real one and then run your tests. Get it offers a reset() method that clears all registered types so that you can start with a clean slate in each test. When starting with Flutter I was looking for recommendations for App architecture and most of the time I found references to the Redux pattern. I’m really honest, Redux never appealed to me. I understand the idea behind the unidirectional data flow but it just seemed too much overhead. But I wanted to take it to a test and try to create App that is identical to one created with Redux but with the RxVAMS pattern (which I proposed in my last blog post) . 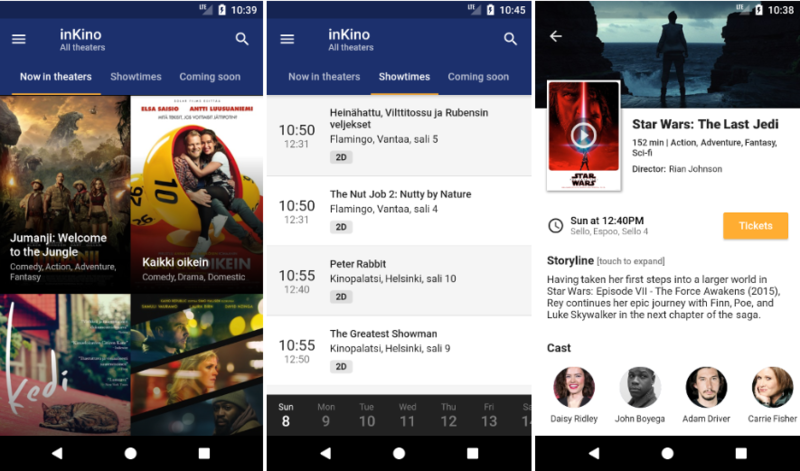 When Iiro Krankka open sourced his beautiful App inKino which is build using redux I had my candidate. I asked Iiro if it would be ok if I take his App and refactor it to RxVAMS and he is looking forward to the outcome. This means Redux needs about 30% more lines and characters of code than RxVAMS to achieve the same functionality. But what if the App gets more complex? As this App only has one real Page with user interaction I use only one class the AppModel to hold all state of the App. If the App would consists of more complex pages the AppModel would provide a PageModel for each of this Pages that would relay data to the AppModel or directly to the service layer. The Redux version stores all app state inside one store class so not so much difference here but it needs a lot more code to access and modify it. 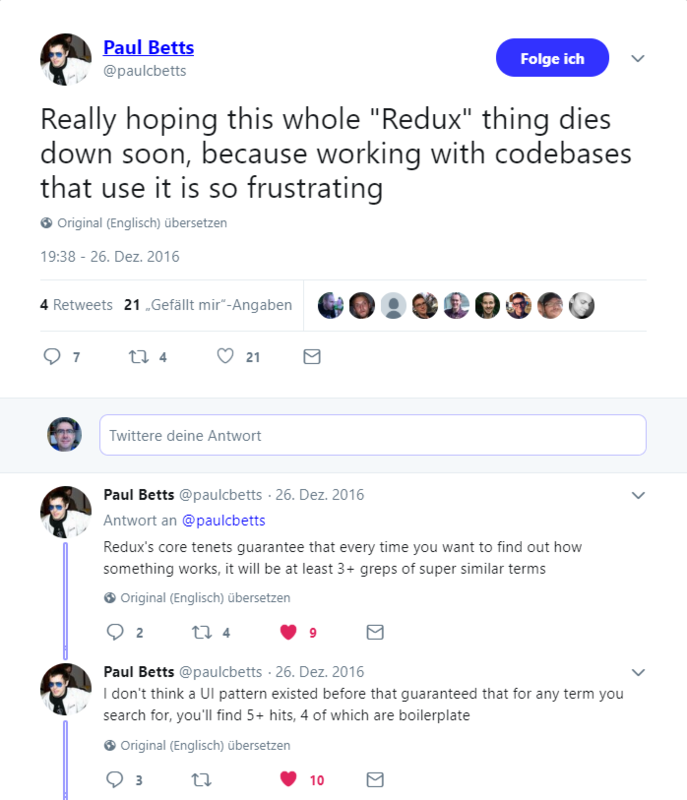 But, but Redux will prevent a lot of errors! True, the fact that views cannot modify state directly but only over dispatching actions might beware you of potential errors but for the price that your code gets much harder to understand and you have to create much more code to reach that goal. More code also means more places to make mistakes. Using Streams and RxCommands to communicate between model and view you get an easier to understandable architecture that works without side effects too and you always can follow your code using your IDE’s search commands. If you ever came back to one of your own project after a year you know the feeling to have the feeling someone else must have written this code. Same for any developer that gets the task of continuing the development of a project because the original creator has left the company. So easy to understand and to follow code is paramount. Why do we use complex patterns? Reusability of code: I really would like to know how many of you have really reused bigger parts of an App in completely different one that wouldn’t be better placed in a independent library from the begin. Exchangeability of components: Often be introduce additional abstraction layers. But who of you have really changed the database after an app was finished? Extensibility: I think it was Kent Beck the creator of Extreme Programming how made the point that using modern IDEs it’s pretty easy to make big refactorings even in large code bases. Having automated tests implemented make sure that you don’t accidentally break something. Error prevention: State management is one of the most difficult areas of any App so using patterns that preventing side effects are a good idea. If one pattern will save you at the end of the day will only show time. Choose a pattern that doesn’t compromise understandability of your code. Testability: This is actual the one that has shown its benefits in daily use. But even here I always will prefer manual Dependency injection before automagically working IOC containers. I don’t say that these goals are not important and may be helpful from time to time but I want to encourage you to question existing development trends and hypes. Trying to strive for simplicity is a good goal overall. O.K. you got it, I don’t like Redux 🙂 You don’t have to believe me so give it a try yourself. Clone both repositories and try to understand how the apps work and share your experiences with us in the comments. I’m really curious to hear them. I’m still exploring how to refine the use of RxCommands with Flutter and there are still some points where I’m not completely satisfied but I will continue this exploration and hope some of you will join me. 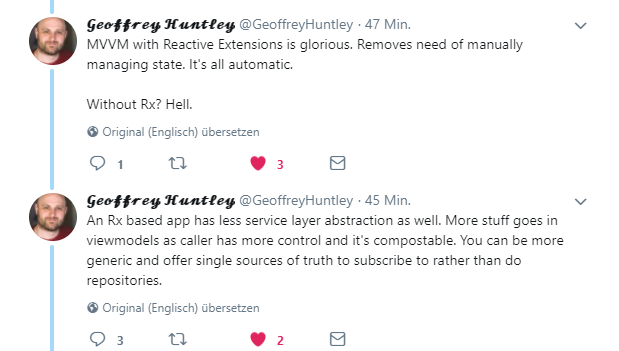 When chatting with some dev about the reactivity of Flutter he made the great statement Flutter is REACTive and not reactive in the sense we know from Reactive Extensions (Rx). Coming from Xamarin and ReactiveUI this somewhat disappointed me because if you once started to think the Rx way you never want to go back. Coming from Xamarin Forms MVVM is the natural architectural pattern for Apps for me. MVVM solves a lot of problems while still is easy to understand and don’t introduce unnecessary components. It basically consists of three layers where the View which consists of all UI elements you see on the screen. It can also contain logic that only concerns the UI. The Model contains your business logic and backend connections. The ViewModel is the glue between both in that it processes and transforms data from the Model to a form the View can easily display. It offers functions (often called Commands) the View can call to trigger actions on the Model and provides events to signal the View about data changes. Important: The ViewModel knows nothing about the View which makes it testable and more than one View can use the same ViewModel. A ViewModel just offers services to the View (events, commands). The _View decides which it uses. To trigger any other action in the View besides data updates from the ViewModel gets tedious because you have to publish events and functions if the View should be able to retrieve data as a result of the event. Another problem is that we always moving state between the different layers which have to be kept in sync. What we really want is an App that just reacts on any event from the outside without having to deal with state management all the time. The ReactiveX Observable model allows you to treat streams of asynchronous events with the same sort of simple, combindable operations that you use for collections of data items like arrays. It frees you from tangled webs of call-backs, and thereby makes your code more readable and less prone to bugs. When working with Rx you define rules how to react on events in a declarative way. This is done in a functional manor to reduce any side effects. 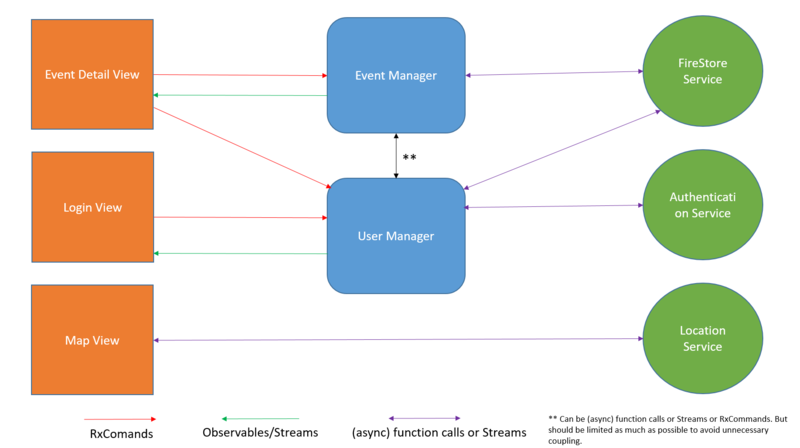 Applied to MVVM this means all communication between layers happen over even streams (called Observable in Rx) and reactive commands. Best of all Observable streams are asynchronous by nature. The Dart implementation of Rx is RxDart. There is another observation that leaves some doubt if MVVM is the right pattern for mobile Apps. MVVM was aimed at sharing the code of Model and even ViewModel between different apps which is really rarely the case. This also separates the App in three layers but replaces the ViewModel with an AppModel that contains the whole app logic and the interface for the View consisting of reactive commands (in the following RxCommands) and Observables that offer state changes to the view. The Model is replaced by a designated Service layer which offers all services that connects the app to the outside (REST APIs, device APIs, databases). Data from the Service Layer is returned as Observable or be asynchronous function calls to make the access asynchronous. If you don’t want to follow this pattern just replace AppModel with ViewModel in your mind for the rest of the post. I made a little demo app to show the following in practise. 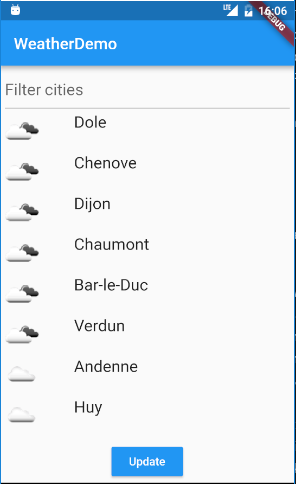 It queries a REST API for Weather data and displays it in a ListView. I made branches for every step of the rest of this post so that you can easily try it yourself. A big, big thank to Brian Egan for polishing the App for the last step, even including unit and UI Tests! To access an object from anywhere in the widget tree Flutter offers the concept of the InheritedWidget. When added to a widget tree the InheritedWidget can be accessed anywhere down that tree by calling its static of() method. In this case the .of() doesn’t return the inherited widget but directly the contained HomePageAppModel instance as it is the only data field. As we want to have our AppModel available anywhere in our HomePage we insert it in the very top of our widget tree. 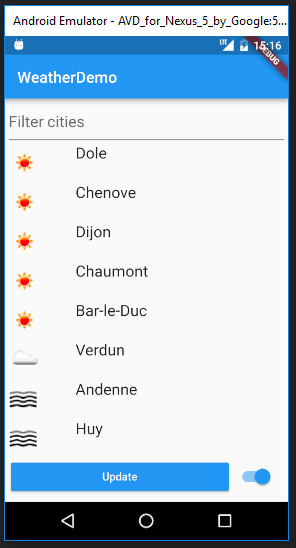 The typical way to react with Flutter on events from a ViewModel is to create a StatefulWidget and subscribe to an event in the initState method of the State and call setState on each event. Anytime someone queues a new Lists of WeatherEntry in this stream this ListView will be recreated with the latest data. // Subjects are like StreamSinks. You can queue new events that are then published on the .observable property of th subject. Querying data and updating are completely decoupled which makes testability easy. and if the user types into the filter TextField. Again the event and the reaction are decoupled through a Subject and and Observable which allows further event processing like the debounce operator which makes sure that only an event is emitted if there wasn’t another change within a given period. So to make your views reactive Streambuilder is the key. So far almost everything besides the debounce could be done too by using Dart Streams instead of Observables. To enable the Views to call functions in a reactive way I wrote the RxCommand package which is heavily inspired by the ReactiveCommand class of the .net framework ReactiveUI. To be more correct this enables AppModels to react “reactive” on function calls from the View. RxCommand takes a function when created through one of its static factory methods. This method can be called by using its execute method or by directly calling the RxCommand object because it’s a callable class. This makes it possible to assign a command directly to an event of a Widget. Nothing special so far but any result of wrapped function is emitted from the RxCommand over its results property which is you might already expect it an Observable. Especially when wrapping an async function with an RxCommand the .exceute will return immediately but the result will be emitted when the function returns. No more Subjects and handler functions just clean RxCommands. Let’s look at it step by step beginning with the textChanged command. The function that it wraps doesn’t do anything else than pushing the passed string out of the RxCommand.result Observable, to which the handler below listens. In other Rx implementations listen is called subscribe. As RxDart is based on Dart’s `Streams’ listen is used. The switchChangedCommand too just pushes the received bool to its result observable. It will be assigned to the onChanged handler of the Switch widget and issue a new bool value every time the Switch changes its state. This may seem a bit pointless because nobody seems to care about this results. But looking at the updateWeatherCommand we see that switchChangedCommand.results is passed as a second (optional) parameter. That’s the next feature of RxCommand you can pass am Observable<bool> which determines if the command can be executed or not. In our case this will make the updateWeatherCommand react to any change of the Switch automatically. .isExecuting emits a bool value every time the execution state of the command changes. So after calling execute it will emit true and when the wrapped function returns (even an async one) it will emit a false. .canExecute emits a bool value every time the executability of the command changes. This will emit false while the command is executing but will also reflect the status of the canExecute observable if one was passed to the when creating the command. This allows to effectively set up rules on executability of multiple commands. .thrownExceptions if there is a listener on this observable RxCommand will catch any exception that are thrown by the wrapped function and emit them here. While Brian did some refactoring on the example app he made the point that it would be helpful to have all three states (isExecuting, results, error) in one stream because Flutter updates its UI by rebuilding it. Using separate StreamBuilder might not always be ideal. /// During normal command execution you will get this items if directly listening at the command. To get notified of any new CommandResult you can directly .listen to the command itself because RxCommand now also implements the Observable interface. In the next step we will use that to our advantage. Using StreamBuilder is one way to react to AppModel events but it makes the Widget tree a bit messy and because I’m also lazy I wrote the rx_widgets package which contain convenience function to work with Streams, Observables and RxCommands. RxSpinner a platform aware busy spinner that takes a Stream and builds a running Spinner on trueand on false and alternative Widget. WidgetSelector builds one of two provided Widgets depending on the bool value the provided Stream emits. 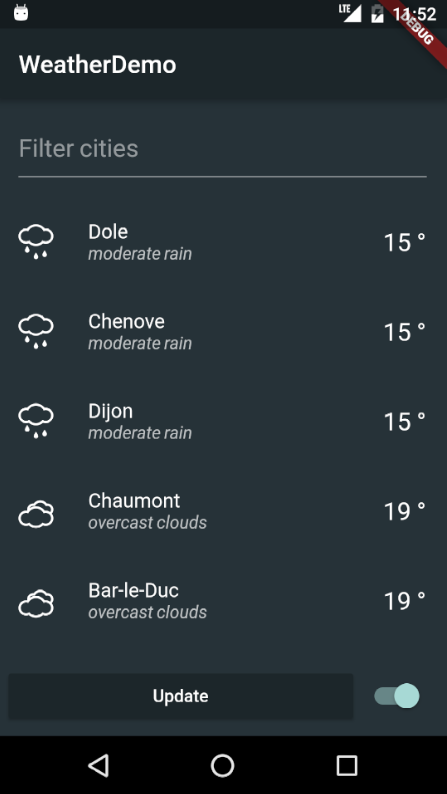 In our app I use it to enable/disable the update Buttton based on the updateWeatherCommand.canExecute Observable. More reactive widget goodies to come soon. If you have an idea for a great RxWidget just open an issue or even better make a PR. By using Streamsor even better RxDart’s Observables in combination with StreamBuilder and RxCommands and rx_widgets can make your App truly reactive. If you got hooked on the idea of streams of events, vote for this Flutter issue to make Flutter use Dart Streams for notifications. As most of you know I really like Xamarin Forms. After a break of halve a year I got back to mobile. First thing was updating Visual Studio with Xamarin. When trying to build my App which built fine the last time I was working on it I got a whole bunch of errors. After 3 hours fiddling with the toolchain I was able to build again. Pretty frustrated because I had hoped that things had improved with Xamarin in the meantime I read that Google just announced the official beta release of its new cross platform mobile framework Flutter. So I decided to have a closer look at it. Flutter is not only a framework, it’s actually a whole tool chain for building native Apps for Android and iOS. You program your UI not in some mark-up language like XAML but completely in code which sounds more cumbersome than it is as we will see. Following the instruction on the Flutter.io page installation on Windows is pretty straight forward. I only had a complain about some Android SDK licences which could be fixed by creating a blank App in latest Android studio. Additionally I installed Dart Code the Dart and Flutter plugin for VS Studio Code. If you install on Mac it can be a bit more work, so had I to upgrade to Mac OX High Sierra and also to update several tools which was ok because the Flutter installer tells you what is missing and how to install. Opening the first sample and hit F5 in VS code and the app was build deployed and started without any problems. I was really surprised because I was no longer used to something like that. Coming from C# I was surprised how easy it is to get accustomed with Dart the syntax is not so much different and on the Dart website you find all you need. I will point out interesting features of Dart when we get to code. This is a typical project structure of a Dart project. All your source files including main.dartare located in the lib folder. For now the only other interesting file is the pubspec.yaml where you register all packages that your project needs as well as all assets. Be careful, yaml files are very picky when you don’t follow the correct indentation. Flutter builds it’s UI completely through composition of Widgets that can again contain Widgets. Yes, in Flutter everything is a Widget, even the App itself. As already mentioned the UI is completely build in code but compared with building a Page in Xamarin Forms this is very straight forward and with a little practice as good readable as a Xaml page. So our page is basically made of a Scaffold container with a Column which contains three “rows”: A TextField, a ListView and a Button. The ListView was moved to its own Class so that the structure keeps readable. As you see this is pretty straight forward. Decomposition in custom classes or just in a function is faster done than creating a custom view in Xamarin Forms. Another advantage in using code to create your UI is that you can use code to dynamically create elements. With Dart 2 it won’t even be necessary to use new because the compiler will infer it automatically so that UI code looks nicer. You may have wonder what this TheViewModel.of(context).update is. That’s Flutter‘s way of providing a DataContext to the Widgets. For this you have to create an InheritedWidget that’s only function is to propagate data down the widget tree from where it is placed in the tree. In this App I placed one at the very root of the tree so that all Widgets have access to my ViewModel. Flutter Widgets are in principle stateless which means you cannot store any data in it as they will completely (not completely true) new created when refreshing the screen. One consequence is that we don’t have permanent bindings between View and ViewModel that update automatically. When I wrote in principle stateless this was not completely true. Besides the StatelessWidget above there are StatefullWidgets too that are made of a Widget and a State object. This State object is persistent during rebuilds of the UI and can so store information and subscribe to event handlers of view models. StreamBuilder is a nice Widget which will execute a builder method that rebuilds its widget subtree each time a new item is issued by a given Stream which allows a reactive design of your app. There is even a Dart version of Reactive Extensions that builds on top of Dart Streams. This means every time the ViewModel pushes new data into the other side of the Stream the ListView will be recreated. All collection widgets in Flutter exist in two versions. One that takes a predefined List of Items and a builder version that calls a handler every time it needs the data for a new row it wants to display which allows easy data virtualisation. Designing in Code together with the instant reload is really fun and fast. Refactoring of widgets like decomposing into smaller units is just a cut and paste in a new file. Debugging is easier too because you have no symbolic bindings. Animations are very very easy. And they look on all platform the same. Compared to a mark-up based framework the learning curve seems not as steep but this might come from my experience with Xamarin. Non UI code of the app can be shared with web versions of it. Very good API docs, examples and tutorial videos. Dart doesn’t support reflection which is good for performance but make a lot of tasks tedious. For instance there is nothing compared to json.net or refit luckily for JSON there is a generator library that creates serialize and deserialize code for your classes. Currently there are no established application frameworks like MvvmCross or similar. Overall there are only little resources on App architecture at the moment. Overall my subjective impression is that I’m much faster in creating appealing pages than in Xamarin Forms. It feels a bit more raw the way you code but also with more control because not so much happens automagically in the background. Currently there is a huge hype around Flutter (20.000 stars on github) and if Google really launches Fuchsia it will be the default framework there. Which lets hope that missing plugins will soon be available. On the other side it’s still in beta and nobody know if Google may kill it before release. My main reason for continuing with it is that I don’t get continuously frustrated by the toolchain and the fast build times. I can only recommend give it a try and see for yourself. Especially try the Flutter Gallery sample in the Flutter repo. Let me know what else do you want to know about Flutter! 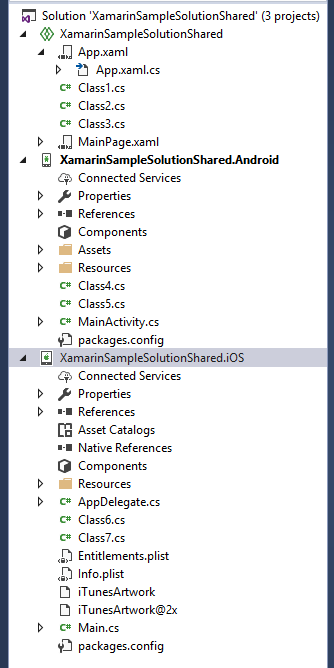 In this post I will try to clear up some missconceptions about the Xamarin Forms project structure, have a closer look at the differences between PCL and Shared Projects and explain some tricks that you can do with both of them. This left the feeling that there must be some black magic going on under the hood that brings all together which left me a bit uncomfortable but it seemed to work somehow. 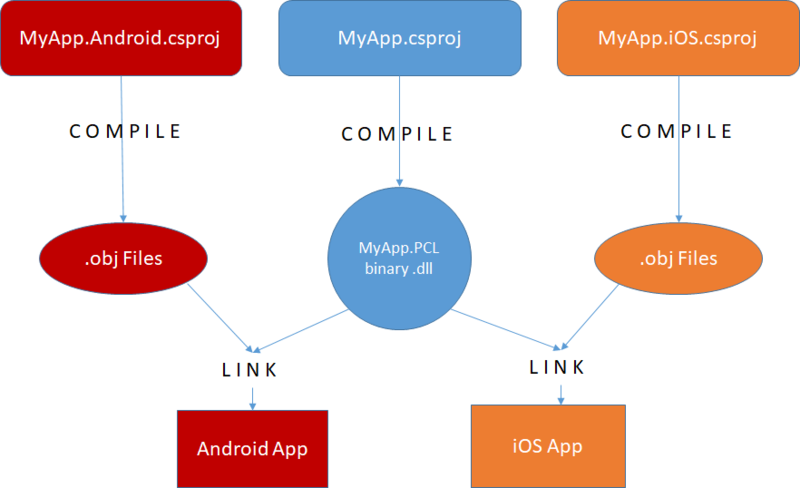 The most confusing part was that all my Apps important code like the App class and all my pages were in the PCL project. So I thought that’s the project that will generate the final App and that the other two just get linked somehow. What I did learn while already happy coding was that the .Android and .iOS projects are the so called Platform Projects which will result in our final App when compiled and linked. This projects will just link in the PCL part which just a dll, that’s all to it. So in reality it was exaclty the oposite that I first thought. This has some interesting consequences. Although code in the PCL cannot access code inside the platform projects the other way round is indeed possible. This suddenly also explained how the DependencyService could work. 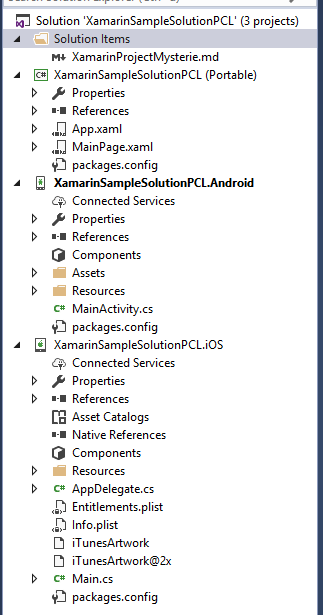 It’s code is located in the Xamarin Forms (XF) library which is a PCL itself and which is referenced from our PCL project and from the Platform Project which makes it possible for the Platform Project to register instances of platform dependent classes inside the XF code which then can be retrieved via it’s platform independent interface from inside our PCL project. In each of the Platform projects we implement this interface with a platform specific implementation. To make everything working together we have to create an instance of the platform specific classes and assign it to this static property and we can use it inside the PCL over this static property. I don’t say that this is an optimal solution! But it should give you a better understanding of how this projects play together. Using a ServiceLocator like the XF DependencyService has the advantage that your PCL code does not use a static property of any of your classes and you can access the instance from anywhere in your code. If you want to use a ServiceLocator I personally prefer Splat which gives you much better control and does work without magical class attributes. What are these other files for? This might seem trivial for some of you but from my experiences in the Xamarin Slack not everyone knows. Stay tuned we will get more interesting stuff in a minute. MainActivity.cs: OnCreateis the first method that is called when your App starts up. So all platform specific initialization should go there. AppDelegate.cs: here FinishedLaunchingis the first Method to get called when our App starts up. If you ask in the community which one of the two you should choose you almost for certainly will hear Shared Projects are bad which actually almost got to some sort of dogma. This is actually a pseudo project which means it’s not a real project at all but a trick of Visual Studio (That’s the reason why you cannot add a nuget to it). All files that you add to this “project” will be added to all platform projects at the same time by using file links. So if all files get compiled to the same binary this means that all files could access platform specific code. 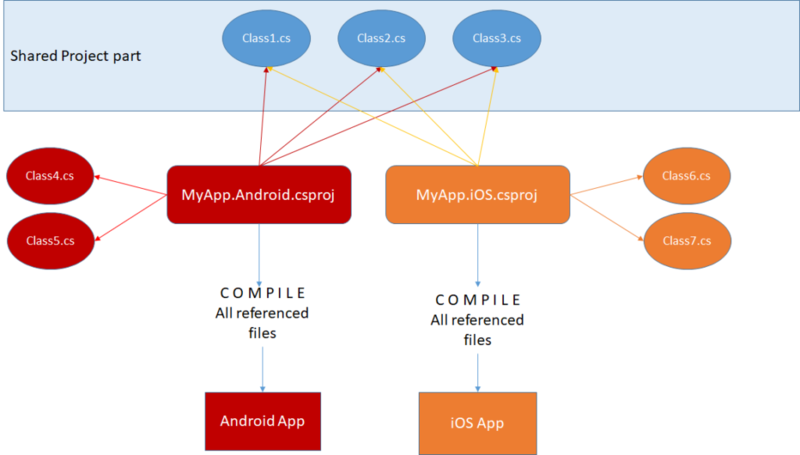 But to be able to compile the files in the shared part in both platform projects they should not do that because what knows an iOS compiler about Android APIs. The idea is that you only put classes in the shared part that don’t use any platform specific code. But (and here comes the critique of the people that think shared projects are bad) you can use #if __ANDROID__ and #if __IOS__ in the shared part to still use platform dependent code which makes a mess of your code and is bad style. That you can do this does not means you have to or you should do and doesn’t make Shared Projects bad. Although it somehow comforts me to know that I have this possibility as last resort 🙂 . As long as you follow this rule there is really nothing bad about Shared Projects and fact is the core App code will seldom reused in another project. Put all code you want to reuse somewhere else in a separate PCL project and reference that from the Platform Projects and you are fine. If you ever used a PCL project you will earlier or later have encountered the moment where a nuget that you want to use does not match the PCL profile of your PCL project which is pretty annoying especially because you cannot change your PCL profile without uninstalling all nugets first. Even worse as more and mode nugets are migrated to netstandardthe successor to PCL you will get more conflicts. A shared project can consume any nuget independent from it’s PCL profile. So for now I actually recommend Shared Projects if you start a new one. This might change when netstandard tooling gets more mature and with the release of netstandard 2.0. As we should not use #if what else can we do. Actually you have two possibilities. You still can use a ServiceLocator like Splat and register your platform specific interface implementations in the Platform project classes and access them via the interface and the Locator in the Shared part. You can use partial classes what someone called the poor man’s bait and switch. This makes especially sense if the class contains platform independent and dependent code.